Boat Trailer Hand Winch v Electric? What is a Trailer Winch? Truck Tool Box Buyers Guide? Trading Prius for Cheap Pickup, What to Buy? Is Aftermarket Tire Siping Worth It? How Many Automotive Floor Jacks Do You Have? When it comes to picking a floor jack you really need to make sure you get one that matches your needs. 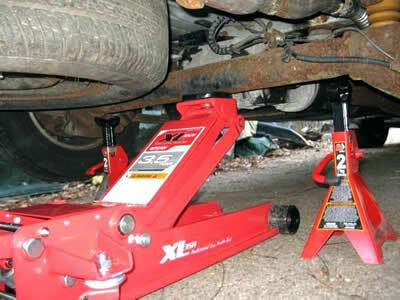 For example the type of floor jacks you’d be looking at if you have a 4×4 truck will be a lot different than if you’re looking for a hydraulic car jack that will fit under your sports car. In that case you’d be better off looking at low profile floor jacks instead of a jack that has a really high lift range to actually get the truck off the ground. You’ve also got to look into things like how much weight can the car jack lift as well as what material you want. Typical weights include 1 ton, 2 ton, 3 ton and 6 ton. For materials you really get two choices. Aluminum and steel. I wrote a good post about aluminum floor jacks just the other day that might be worth checking out. You’re probably curious how I know so much about automotive floor jacks or maybe you’re just curious what floor jacks I actually own. If I was reading a site with a ton of information about anything I’d want to know where the writer got their expertise. Below is a quick list of the jacks I own and how they’ve worked out for me over the years. This is the main floor jack we use when we need just one. It’s extremely heavy, was fairly expensive, and works very well. If you are only going to get one automotive jack this is the one to buy. I even write a review about it in an earlier post. These guys were a presents from my Dad and they are actually my favorite automotive floor jacks. They are only 2 ton jacks which are fine, but they are 100% aluminum which makes them so incredibly light it’s just amazing. They also are some of the lowest floor jacks I’ve ever used. For example my brother has a Honda Civic that is lowered just a bit, but the front bumper is extremely close to the group and this jack slides right under it without any problems at all. These jacks do have a downside however and that’s quality of the piston used on them. It’s in my experience that if you are careful using them they last a lot longer, but rough use will shorten the lifespan considerably and they will start to leak. These automotive floor jacks are pretty old and they both work very well even after 5 years of constant rough use. They have never leaked, not worked, or had a single problem. The problem with these automotive jacks is that the pump to lift ratio is really really really short. You pump multiple times and the jack only raises up 1 inch. It’s not a disadvantage as much as a point to let people know about. The quality of this floor jack is amazing though and both have been very reliable. Five floor jacks may seem like a lot, but when you’ve got a garage that my Dad, brother and I all use quite often, having that many really is a nice thing to have. You’re probably wondering why we don’t just have 5 floor jacks that are all the exact same model, etc. 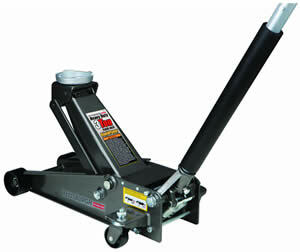 The reason is each automotive floor jack has a distinct advantage that is unique to that jack and helpful when working on certain cars. You can see this in my which floor jack for SUV’s review, a floor jack is like any other tool in the workshop, you need the right one for the job! Pickup World Copyright © 2019.